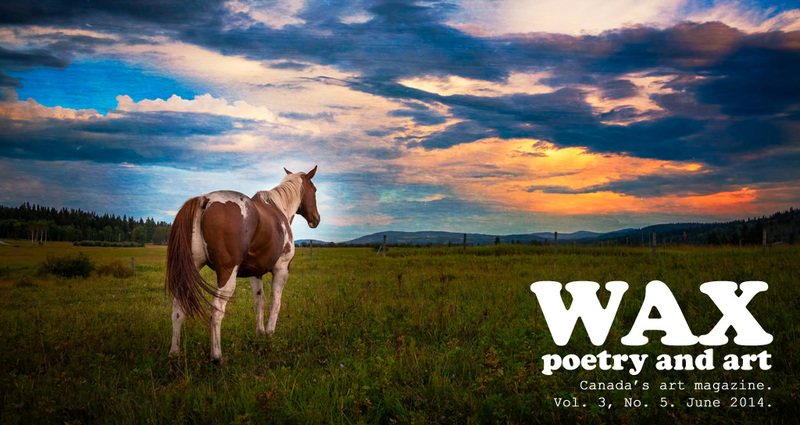 Wax Poetry and Art Magazine - Vol. 3, No. 5. June 2014.
cover image or page numbers above to go directly to the art. Volume 3, Number 5. June 2014. Mailing address and telephone: Inquire by email. Cover image: "Uninterrupted View" by Hiro Kobayashi. Read The Letter from the Editor. Contributor Biographies - Click names to go to a page with that artist's work. Aaron Peterson / Visual Art / Calgary, Alberta. Aaron is a painter living in Calgary, AB. music as a member of the hiphop duo, Retros Finest. vivid imagery for years and has recently moved into the medium of creative painting. community, as well as the North American, and Global, spoken word scenes. Revv52. I enjoy acting, exercising my brain and body, and watching Star Trek. National photo competition by Professional Photographers of Canada. was short-listed for both the Gerald Lampert and W.O Mitchell awards. artwork in Qwerty; The Centrifugal Eye. imagination in her peers and students alike. Bannister, Blue Skies, and NoD Magazine. He is an organic farmer by trade. this existence with those around us. and is published, commissioned and privately collected. sharlenawood.com. (“I shouldn’t feel for you like this REMIX”). His first album was independently released. act of being creative is the outlet used to communicate my subconscious.